L.I: to make connections, identify main ideas, summarise, evaluate and synthesise facts through learning conversations. This week for reading, we've been learning about the women's suffrage movement. Our must do was to complete two activities that showed a resemblance to the suffrage movement, but we were to only blog one. 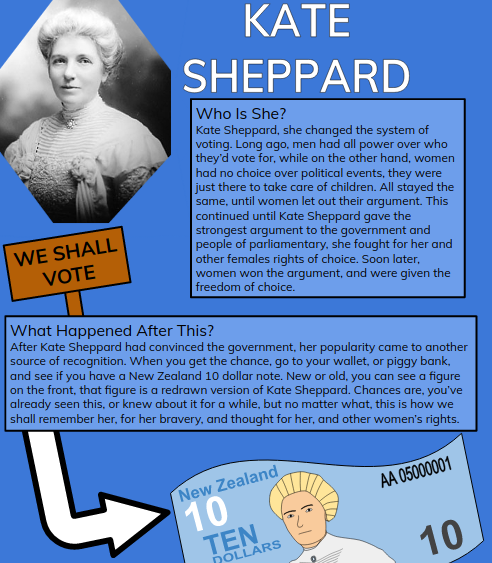 Below I created a poster about the famous Kate Sheppard, my poster needed to include a balance of imagery and information, so I added in an more artistic part to my poster. To do that, I created my own version of the New Zealand 10 Dollar Note. I had two subheadings, Who Is Kate Sheppard, and What Happened After What She Did.